provided communication support on April 21 for the 118th running of the Boston Marathon -- a 26.2-mile race from Hopkinton to Boston, Massachusetts. In a show of solidarity following last year's tragic bombings close to the finish line, a near record number of runners -- upward of 36,000 -- turned out for the Patriot's Day event along with a huge outpouring of spectators. 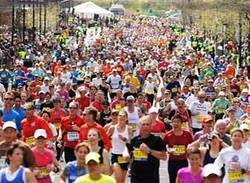 The Boston Marathon is a major public service event for the region's Amateur Radio volunteers. "We received a fantastic showing of volunteer support across the start, course, and finish line from the Amateur Radio community in the wake of the 2013 bombings," said Steve Schwarm, W3EVE, Boston Marathon Course Coordinator. The level of ham radio support for the 2014 event demonstrated that "Boston Strong" remains a rallying cry in the wake of last year's tragedy, he said. Amateur Radio communication support became critical in the aftermath of the 2013 Boston Marathon bombings, when conventional telecommunications systems, such as cellular telephones, quickly became overloaded and confusion reigned. 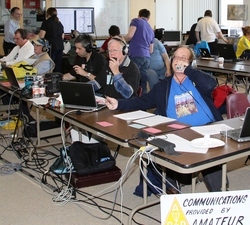 Amateur Radio had a larger presence this year at the Massachusetts Emergency Management Agency (MEMA) State Emergency Operations Center (SEOC), where a multi-agency coordination center was set up for the race. The SEOC worked closely with the Boston Marathon Amateur Net Control Center, the BAA Operations Center at Boston Public Library, and the Red Cross Disaster Operations Center in Cambridge. ARRL Eastern Massachusetts ARES Section Emergency Coordinator Rob Macedo, KD1CY, has served in various capacities over the years as part of the Boston Marathon ham radio contingent. "This year, I was at the SEOC multi-agency coordination center with MEMA Region 1 Communications Officer Terry Stader, KA8SCP, where we provided assistance for the Amateur Radio operation and situational awareness and an alternate communication path to the marathon for MEMA Headquarters," he said. Schwarm said that one unsung hero of the Boston Marathon Amateur Radio Communications Team is Bob DeMattia, K1IW, whom he called "the mastermind behind an elaborate net control setup" just off the race route with a line-of-sight shot to Boston. "Through a combiner and utilization of various frequencies across 2 meters, 1.25 meters, and 70 centimeters, up to 10 Amateur Radio setups were provided at the net control location with multiple antenna configurations," Schwarm explained. "Bob has done this set-up work for many years." This year one of the 2 meter repeaters for the race course operation went down less than 24 hours before the start of the Boston Marathon. "Bob responded to the situation...and had the repeater back in operation just as the marathon was starting," Schwarm said. Schwarm also expressed his appreciation to his assistant, Jim Palmer, KB1KQW, for his support as an assistant course coordinator, as well as to Paul Topolski, W1SEX, who handled finish-line operations, and to Kevin Paetzold, K1KWP, for supporting starting-line operations. Paetzold echoed Schwarm's praise of DeMattia. "It is immense; it has been happening for many years and seems mostly invisible," he said. Paetzold said there were four ham radio teams -- 34 volunteers in all -- at the starting line. His primary assistant, Dave Wolfe, KG1H, oversaw the South Street parking operation, while Jonathan Allen, K2KKH, was responsible for the Hopkinton State Park parking operation, while Pi Pugh, K1RV, handled the Athlete's Village operation -- jobs both have done for many years. Topolski said hams anticipated security issues, but none arose. "Nobody had a hassle," he told ARRL. A new twist this year was that the operation went from the separate command trailers used in past races to an indoor command center. "I think the operations center is a definite plus, and I think we're going to go with that in the future," he said. MEMA dispatchers. Hams on the course were issued UHF digital radios to request police, fire, and EMS. "It was an additional resource," he said. "That worked out well." Macedo said Amateur Radio operators very quickly had to learn the new UHF commercial system. Topolski said ham radio came in handy after the Boston Fire Department was called to Boylston Street in downtown Boston following a report of a possible natural gas leak. "At almost the same time, one of the hams on the street was smelling natural gas coming from a manhole," he said. "The fire department was looking in one place, while the ham down the street was actually at the site of the leak." 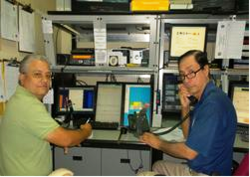 Amateur Radio volunteers in Puerto Rico participated in the CARIBE WAVE/LANTEX 14 exercise in March. The purpose of the exercise was to assist tsunami preparedness efforts in the Caribbean and adjacent regions, including the east coasts of the US and Canada. Since 2010, Amateur Radio has played a role in the exercise, executed in Puerto Rico in conjunction with the Seismic Net of Puerto Rico (RSPR), FEMA, the Puerto Rico Emergency Management Administration (PREMA-AEMEAD), and NOAA. The March 26 drill offered a choice of two scenarios: An earthquake on the coast of Portugal, or a sub-marine landslide in the Gulf of Mexico. Puerto Rican agencies chose the Portugal scenario, based on a similar earthquake and tsunami event that occurred in that country in 1755. The exercise commenced at 6 AM, when the simulated alert notification of an 8.5 magnitude (Richter scale) earthquake was issued. The Emergency Alert System (EAS) was activated at 10 AM on radio, TV, and cable outlets to announce the "situation" but advising listeners that it was a drill. Siren systems were tested, and government, public and private institutions in many cities conducted their own evacuation drills to test their preparedness and the ability of citizens to travel safely to their nearest local refuge sites. Amateur Radio worked with PREMA at an island-wide level. The Cuerpo de Voluntarios Radioaficionados de Puerto Rico (Volunteer Amateur Radio Corps of Puerto Rico -- KP4CVR) was the main player, activating from the 12 PREMA zones. Through a federal grant, each zone facility is equipped with an HF/VHF transceiver. The point of contact was the KP4CAR repeater (147.210 MHz), located at the highest point of the island. The repeater can run for several days on emergency power. The main responsibility of radio amateurs was to gather reports from other amateur stations around the island regarding how they were alerted: Broadcast radio, TV, cable, or other means such as sirens. The information is delivered to PREMA Headquarters for post-exercise evaluation and planning. At the municipal level, the Bayman Radio Club, an ARRL Affiliated Club, assisted emergency managers in the northern city of Dorado, recently certified as "tsunami ready." Organized by Jimmy Drowne, KP3BR, operators volunteered to assist with any kind of communication problem during the exercise, and the group was commended for its support of the drill. The FCC has cited a Woodinville, Washington, resident for operating an "incidental radiator" -- apparently some sort of lighting device -- that has been causing harmful interference on Amateur Radio frequencies. The Commission has ordered Thomas Edward Rogers to "take steps to eliminate all harmful interference" or risk substantial fines and seizure of equipment. The Enforcement Bureau action came in the wake of repeated complaints last year of interference to Amateur Radio operations. To date, Rogers has not responded to several communications from the Commission. "Commission agents have made multiple unsuccessful attempts in writing and via phone calls to contact Mr Rogers regarding unauthorized and unlicensed radio frequency emissions emanating from his property," the FCC said in a Citation and Order released April 24. The Commission directed Rogers to "cease operation of the incidental radiators immediately, until the interference is resolved." Last year, agents from the Enforcement Bureau's Seattle Office twice visited Rogers' neighborhood and confirmed through direction-finding techniques and the use of a spectrum analyzer that "signals on frequencies between 7 and 8 MHz were emanating from Mr Rogers' residence," the FCC recounted. The C&O said Rogers failed to reply to an "RFI Letter" and a subsequent Warning Letter, and the interference complaints continued. The FCC said Rogers is violating Part 15 rules that prohibit the operation of an unlicensed intentional, unintentional, or incidental radiator that causes harmful interference to a licensed radio service. Rogers was ordered to respond in writing within 30 days stating that he has ceased operating the incidental radiators, and to tell the Commission what he has done to eliminate all harmful interference. The FCC warned Rogers that he faces "severe penalties, including fines of up to $16,000 per day," if he fails to take action to resolve the interference issue. In March, FCC Chairman Tom Wheeler tapped Travis LeBlanc as acting Chief of the Enforcement Bureau, and ARRL CEO David Sumner, K1ZZ, said the Bureau already appears to have become more responsive. "The Seattle Office's prompt investigation of an amateur's complaint in May 2013 set the wheels in motion leading to this Citation," Sumner said. "Today's announcement provides further evidence that with the recent change in leadership of the Enforcement Bureau, there's a new sheriff in town." A Texas radio amateur has turned in his Amateur Extra class license as part of an agreement with the FCC to settle an enforcement action against him. 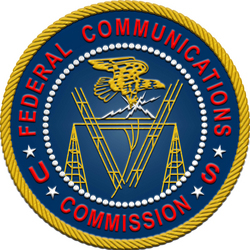 The FCC earlier this year issued a Notice of Apparent Liability for Forfeiture (NAL) to James R. Winstead, KD5OZY, of Coleman, Texas, after determining that Winstead "apparently willfully violated" FCC rules by interfering with Amateur Radio communications. The Commission had proposed a $7000 fine. The action was in response to other radio amateurs' complaints of intentional interference on 7.195 MHz. "Mr Winstead has admitted that his actions violated the Commission's rules and agreed to voluntarily relinquish his amateur license and make a $1000 voluntary contribution to resolve the [Enforcement] Bureau's investigation," the FCC said in an Order released April 22. The Order adopts a Consent Decree between the Enforcement Bureau and Winstead that spells out the details of the settlement. According to the Consent Decree, Winstead will make his "voluntary contribution" to the US Treasury in 12 installments. He also agreed to relinquish his Amateur Radio license, prior to signing the Consent Decree. Such agreements between the FCC and violators have become more common recently in both Amateur Radio and non-Amateur Radio enforcement cases. ARRL CEO David Sumner, K1ZZ, expressed appreciation to the Enforcement Bureau "for bringing the matter to a prompt conclusion." Read more. 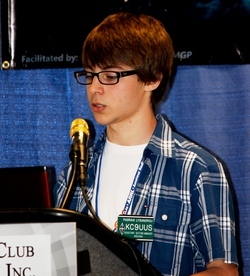 Padraig Lysandrou, KC9UUS, speaks at the 2013 Dayton Hamvention Youth Forum. Indiana. The 17-year-old Bloomington High School South senior has been licensed since 2011, is Indiana's Assistant Section Manager for Youth, and is in the top 10 percent of his class. Lysandrou's May 2013 QST article "A Crazy Idea: DXpedition to Cyprus," won the QST Cover Plaque Award for that month. 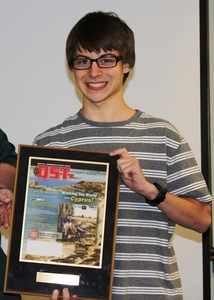 Last August, Lysandrou was honored as "Young Ham of the Year" by Amateur Radio Newsline. "I'm honored to be recognized by the ARRL with the Goldfarb Memorial Scholarship, and very thankful to be part of the Amateur Radio community," Lysandrou said. "The ARRL and the Amateur Radio community as a whole has been one of the most amazing and supportive communities I have been a part of, and I am honored to have a place in it." His is a "ham radio family." His mother, Carolyn, is KC9URR, his father, Plato, is KC9VIL, and his sister, Helena, is KC9VIM. As a young stamp collector, Padraig got interested in ham radio through his mother, a serious shortwave listener. She would show him stamps on letters she'd received from stations she'd heard. "I saw those, and...I got into shortwave," he told ARRL in 2013. "And, then the interest grew bigger, and it wasn't just about stamps anymore. And so I got interested in ham radio." Padraig Lysandrou, KC9UUS, receives the May 2013 QST Cover Plaque Award. An ARRL member, Lysandrou holds an Amateur Extra ticket and has served as president of his school's Amateur Radio club (K9SOU). Participation in the ARRL School Club Roundup and a program on the Peter Island 3Y0X DXpedition sparked his interest in DX and led to his DXpedition to Cyprus, where he has family, and to his QST article. He has been a 4-H member for 10 years and the president of his school's 4-H Aerospace Club. A musician, Lysandrou plays the cello and the classical guitar, and has performed on the cello at Carnegie Hall. Because of his interest in Amateur Radio, he plans to pursue a career in electronics, engineering, and physics. This week he made the decision to attend Cornell University this fall, majoring in physics and physics engineering. His sister is also a high school senior and college bound in the fall. The William R. Goldfarb Memorial Scholarship is the result of a generous endowment from William Goldfarb, N2ITP (SK). Before his death in 1997, Goldfarb set up a scholarship endowment of close to $1 million in memory of his parents, Albert and Dorothy Goldfarb. It is awarded to one high school senior each year. The award is based on an applicant's qualifications, need, and other sources of educational funding, but it can amount to $10,000 or more. Read more. The ARRL Centennial W1AW WAS operations taking place throughout 2014 from each of the 50 states now are in New Jersey (W1AW/2) and New Hampshire (W1AW/1). They will relocate at 0000 UTC on Wednesday, April 30 (the evening of April 29 in US time zones), to Connecticut (W1AW/1) and Nevada (W1AW/7). During 2014 W1AW will be on the air from every state (at least twice) and most US territories, and it will be easy to work all states solely by contacting W1AW portable operations. The operating schedule has been updated to reflect some changes: Maine and New Mexico have swapped weeks; New Mexico's second week will start on September 24, and Maine's second week will begin on December 3. The District of Columbia's week will start on October 1. North Dakota's second week will begin on August 20. Puerto Rico will now have a second week of operation starting November 26. "It is basically the same as HAARP for the science, except that HAARP was in the Auroral Region, where the physics of the ionosphere is quite different with all the energetic particles and magnetic fields," Penn State Electrical Engineering Professor Jim Breakall, WA3FET, told ARRL. "HAARP also had 3 gigawatts of effective radiated power, where Arecibo will only be about 200 megawatts." 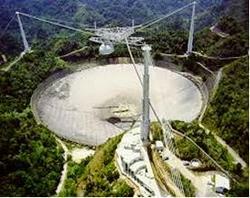 The Arecibo Observatory Amateur Radio Club, KP4AO, is headquartered at the research facility, which celebrated its 50th anniversary last fall. The National Science Foundation and Cornell University, which previously operated Arecibo Observatory, contracted with Penn State's Electrical Engineering Department to construct the "new and enhanced" HF ionospheric instrument. It will be used to study the interaction between HF radio energy and ionospheric plasma. The new facility will replace an earlier ionospheric heater in Islote, Puerto Rico, that was destroyed by Hurricane Georges in 1998. Rather than rebuild that installation, the new instrument will use the observatory's 1000 foot dish for its antenna. This will keep all research activities involving ionospheric modification at the observatory proper. Plans call for a design based on a Cassegrain-screen concept of phased array at the bottom of the dish feeding a sub-reflector mesh that hangs above the dish from three support towers. Breakall and his team of graduate students at Penn State have done all of the electrical design and modeling of this new antenna system. "There are three crossed-dipoles for 5.1 MHz and another three for 8.175 MHz, forming an array that will beam energy up to a net mesh reflector that will hang from the three big towers," Breakall explained. "This Cassegrain screen will then reflect energy back down to the 1000 foot dish and beam an effective radiated power of hundreds of megawatts up to the ionosphere to modify it." Each dipole is fed from a 100 kW transmitter, yielding a total transmitted power of 600 kW. 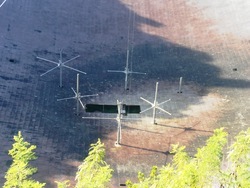 An even earlier HF ionosphere-heating antenna system also was suspended from the platform above the dish and driven by a single 100 kW transmitter over a frequency range of 3 to 10 MHz. That design suffered from arcing problems and was taken out of service in the 1970s. Scale aside, Breakall said, while HAARP also tried to modulate the ionosphere's naturally flowing currents to create VLF and ELF for submarine communication, Arecibo "has much weaker currents, and that probably will not work," he said. On the other hand, he said, "Arecibo has a big advantage over HAARP in that the same 1000 foot dish can be used for diagnostics with the 430 MHz incoherent scatter radar that can measure things such as temperature, density, winds, etc, as they are modified. HAARP has nothing like this." Breakall said he does not anticipate that the new Arecibo ionospheric research facility will attract the same degree of controversy that HAARP has over its history, but he conceded that it's possible. "All of the conspiracy stuff about HAARP really is not true, and I am sure Arecibo could get some of the same conspiracy [talk], and I think some of it maybe has started already," he said. A few dozen special event stations will take to the air on Saturday, April 26, from 0000 UTC to 2359 UTC, to commemorate International Marconi Day. Among them will be GB4IMD, in Cornwall, England; OE14M, in Vienna, Austria; IY0IMD in Italy; VO1AA, on Signal Hill in St Johns, Newfoundland; VK2IMD in Australia, and WA1WCC on Cape Cod, Massachusetts. All stations planning to participate are urged to register. OE14M is among the special event stations that will be on the air for International Marconi Day. International Marconi Day is a 24-hour Amateur Radio event held annually to celebrate the birth of Guglielmo Marconi on April 15, 1874. IMD is held each year on a Saturday close to Marconi's birthday, with Amateur Radio stations on the air from around the world, including Award Stations operating from historically significant sites. Zac Manchester, KD2BHC, of the KickSat project, reports the satellite launched successfully April 18 at 1925 UTC and successfully attained low-Earth orbit. "We at Cornell and several Amateur Radio operators around the world have made contact with the spacecraft, and it is alive and well," Manchester said. Launch of the SpaceX ISS resupply mission vehicle carrying KickSat and other satellites into orbit. The Cornell grad student has announced that he will offer prizes to the first several people who receive telemetry packets from KickSat as well as the first few who receive signals from the tiny Sprite satellites that KickSat will deploy in early May. 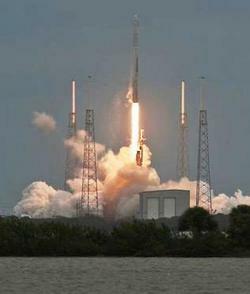 After a launch delay, KickSat went into space with the third SpaceX ISS resupply mission. Next month the 3U KickSat CubeSat will release more than 100 Sprite satellites -- each about the size of a small cracker -- into orbit. They will become the smallest Earth-orbiting satellites ever. The KickSat beacon (437.505 MHz and 2401-2436.2 MHz) will transmit telemetry packets with information such as battery charge state, temperature, and Sprite deployment status. Packets will be transmitted every 30 seconds when the satellite is powered on, and every 250 seconds when it is in charging mode. All of the Sprites will be on the same frequency -- 437.240 MHz. manages the Dwingeloo Radio Telescope, which had remained largely idle since 1997. Its owner is the Dutch Institute for Radio Astronomy (ASTRON). Queen Juliana and Jan Oort , founder of radio astronomy in the Netherlands, were present at the telescope's inauguration on April 17, 1956. For about 60 youngsters of various ages the re-opening festivities featured activities on astronomy and modern technology, including a discussion with the children about science and technology. With the renovation complete the radiotelescope will be used by Amateur Radio, amateur astronomers, and by and for budding researchers. Peter Jelgersma, PA8A, has told ARRL that the giant dish will be put to use on 1296 MHz and perhaps elsewhere. The Dwingeloo Radiotelescope for several years has been used by Dutch radio amateurs for EME work, including during the ARRL EME Contest. 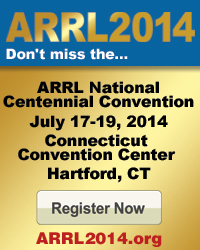 Joe Taylor will speak at the ARRL National Centennial Convention in Hartford, Connecticut on Saturday, July 19. War is always terrible, and World War II was one of the worst. But, while war wreaks havoc and destruction on nations and people, it always brings about major advances in technology that can be transferred to peacetime use. Amateur Radio benefitted from many of those advances following World War II. During the war years, reliable communication was essential. Studies of the characteristics of the ionosphere and how sunspots affect propagation tremendously enhanced our understanding of signal propagation. The upper limit of easily usable frequencies had been pushed much higher during the war. Through QST, the League made sure hams learned about such scientific progress. Much military surplus equipment was not well suited for ham use, but many hams figured out how to convert those radios for the ham bands. Others recycled the components. The prices of parts, tubes, and coaxial cable were remarkably low. During the war, the military or the federal government purchased virtually the entire production output of radio equipment manufacturers. Within months of the war's end, equipment manufacturers had switched to producing ham gear -- and it was far superior to what had been available before the war. After World War II, the ARRL announced that hams -- whether seasoned old-timers or brand-new licensees -- would have to start from scratch to earn the postwar DXCC. That made for lots of excitement when the HF bands again were opened to ham radio. 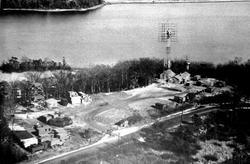 In January 1946 Project Diana used a converted military transmitter to send a radio signal to the Moon, which bounced back to Earth and was detected by equipment at the Evans Signal Laboratory at New Jersey's Fort Monmouth. A 0.25 second pulse of 111.5 MHz energy was beamed at the Moon, and 2.5 seconds later a faint "beep" was heard by Herb Kauffman, W2OQU, one of several hams involved in the experiment. "Maunder Minimum" Webinar Set: The World Wide Radio Operators Foundation (WWROF) will host a webinar, "Are We Headed Into Another Maunder Minimum? What Does That Mean for Propagation?" with Carl Luetzelschwab, K9LA. The webinar will take place April 25 at 0100 UTC (the evening of April 24 in North America). Participants must register. NCDXF Aiming Scholarship Support at Young DXers: The Northern California DX Foundation (NCDXF) said it plans to direct its scholarships toward the support of new DXers, aged 25 or younger, at Contest University (CTU) sessions over the next 2 years. NCDXF Vice President Glenn Johnson, W0GJ, reported that the Foundation provided approximately $99,000 to support DXpeditions to "rare and most difficult entities." At the recent International DX Convention banquet, NCDXF received a $12,000 donation from the Southern California DX Club. W9DXCC 2014 Convention Set for New Location: The 2014 W9DXCC Convention, sponsored by the Northern Illinois DX Association, will be held September 19-20 at a new location -- the Hyatt Regency Hotel in Schaumburg, Illinois. The 2014 event will feature a full day of DX University sessions on Friday and an expanded convention setting on Saturday. Commercial exhibit areas have been expanded and are closer to the main convention activity. Details are on the W9DXCC website. Ham Radio Emergency Communications Exercise Open to International Participation: Spain's fifth Emergency Communications National Exercise (ENCE) takes place Saturday, April 26, 1830-1930 UTC, and international participation is invited. This year's exercise will use the 5 MHz band (5.311.5 MHz USB), but activity is expected on 3.760 MHz, 7.110 MHz, 14.300 MHz as well as on VHF bands. The purpose of the exercise is to provide an opportunity for those radio amateurs interested in practicing operating skills. Even listeners can participate. The ENCE welcomes reports via e-mail. Vibroplex Becomes SSB-Electronic Distributor for US and Canada: Vibroplex has become the US/Canada distributor for SSB-Electronic products. A completely revamped product line has been released for 2014. Tad Cook, K7RA, Seattle, Washington, reports: Average daily sunspot numbers during the past week rose 84.3 points, from 118.4 to 202.7. Average daily solar flux was up 11.3 points to 160.4. The predicted average solar flux on April 19 for April 24-27 was 150, but this has been downgraded. On April 23 the average for the same period was adjusted down to 122.5. 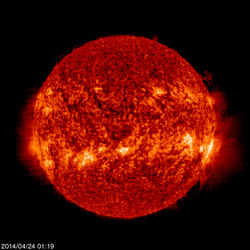 The latest projection has solar flux at 125 on April 24-26, 115 on April 27 through May 1, 155 on May 2-4, 160, 165, 160, 155, and 150 on May 5-9, 155 on May 10-14, 150 on May 15-17, and 165 on May 18. Predicted planetary A index is 8 on April 24-25, 5 on April 26 through May 13, followed by 10, 8, 15, 25, 20, and 10 on May 14-19, and 8 on May 20-22. Petr Kolman, OK1MGW, of the Czech Propagation Interest Group on April 20 predicted geomagnetic conditions to be quiet to unsettled on April 24-25, mostly quiet on April 26-28, quiet on April 29, mostly quiet on April 30, quiet on May 1-2, mostly quiet on May 3, quiet to unsettled on May 4, quiet on May 5, quiet to unsettled on May 6-7, quiet to active on May 8-9, quiet to unsettled on May 10-11, mostly quiet on May 12-13, quiet to unsettled on May 14-15, and mostly quiet on May 16. Visit the Contest Calendar for details.